This course will enable one to recite the Quran proficiently. The rules in Introductory Arabic will be elaborated on and one will obtain practical experience in reading the Quran. 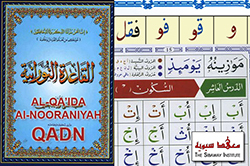 Al-Qaidia Al-Nooraniyah is a well-known program that is used throughout the world due to its proven effectiveness and comprehensive methodology. The ease in which the Tajweed rules are taught makes this the ideal method for anybody to learn Quran recitation. You can access this course for free when you enrol in Introductory Arabic. You will have access to the course material and download it for future reference.